As a young artist working in Florence Michelangelo was taught the art of fresco painting by his superiors. However records show that it was not long before he began to sculpt. Between the ages of thirteen and fourteen Lorenzo the Great saw Michelangelo sculpting a faun's head and it was this that secured his successful future. Throughout his career Michelangelo preferred to create sculptures rather than paintings. Yet, in his old age he did say that he thought it was more important to create great art rather than discuss what constituted great art. Michelangelo spent the majority of his life studying the human form and was obsessed with the body being a physical representation of the soul. Michelangelo produced three pieces that are considered some of the greatest works of art in history; Pieta, the ceiling of the Sistine Chapel and the dome of St Peter's Basilica. Like many of the Renaissance masters Michelangelo was an artist who worked with different art forms. 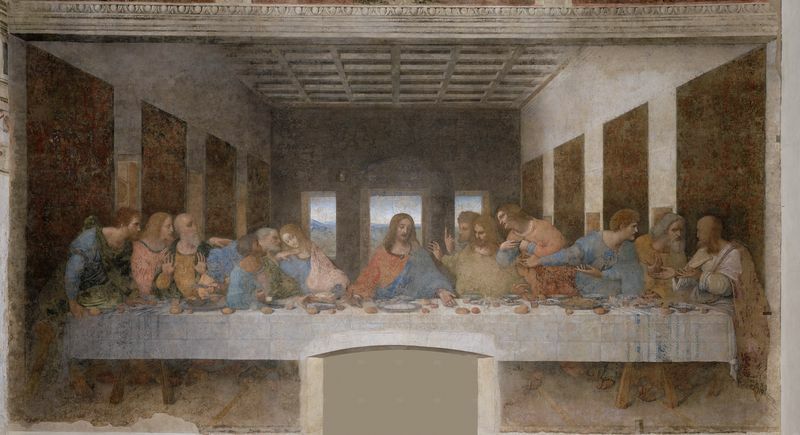 Although he primarily considered himself a sculptor, he created some of the greatest fresco paintings and architecture the world has ever seen. At the young age of thirteen, when Michelangelo was working in Ghirlandaio's studio, he learnt the technique of painting frescoes and always said he preferred to work this way rather than with oil paints. In his frescoes Michelangelo never created his forms with a soft focus and believed it was more important to create figures with clear outlines, which was a Florentine tradition. When Michelangelo created the frescoes in the Sistine Chapel he did not consider himself to be a painter because during his career he had primarily been working with sculpture. Even so this is difficult to believe due to the sheer size and beauty of his art. 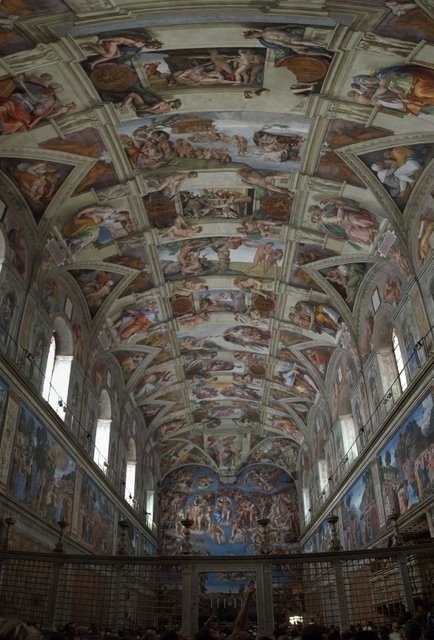 The Sistine Chapel was painted with bright, light colors that daringly harmonized. 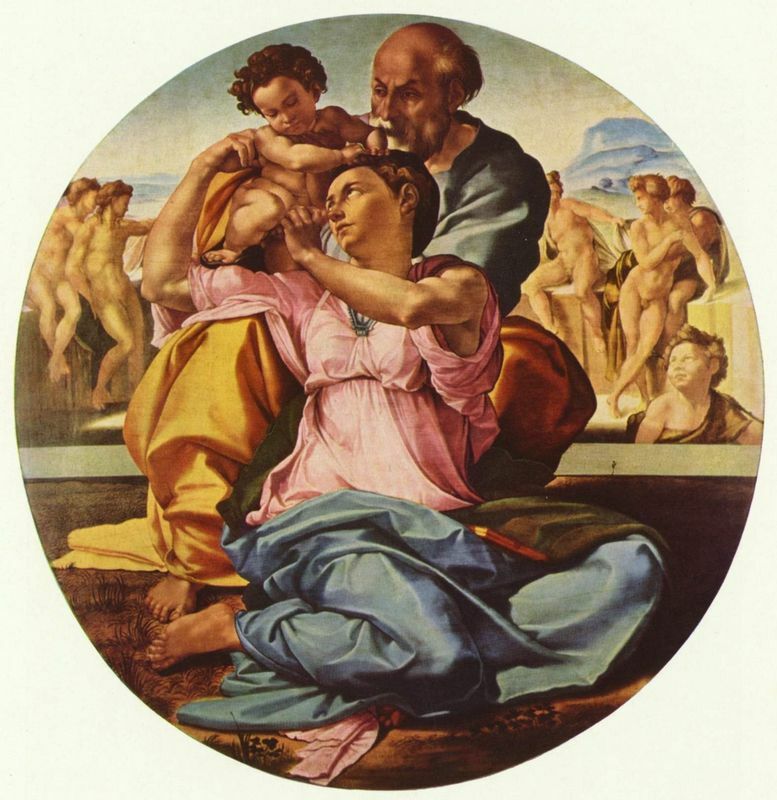 Michelangelo painted freely and with great dynamism. During the high Renaissance there was a marriage between the Catholic religion and Greek mythology. For example, in the Sistine Chapel there is a meeting between God and Adam that is reminiscent of the Classical myths, man and God have been placed together and communicating. Despite the pagan elements, there's a clear Christian message in the piece. As can be seen in the frescoes in the Sistine Chapel Michelangelo was obsessed with the human form above all else and unlike da Vinci, he rarely spent time working with nature. Despite his irritable personality Michelangelo revered others and wanted to be liked. Thus in all of his works he focused his energies on understanding the form of the human figure. Michelangelo thought that the human body was a beautiful entity that should be naked, or only wearing simple robes. Thus, like the classical Roman statues Michelangelo's David has been created with a herculean physique. Michelangelo revealed his hero waiting to meet the enemy rather than in victory. Furthermore, he showed David's strength through his sinewy body that reveals the future power he will display. 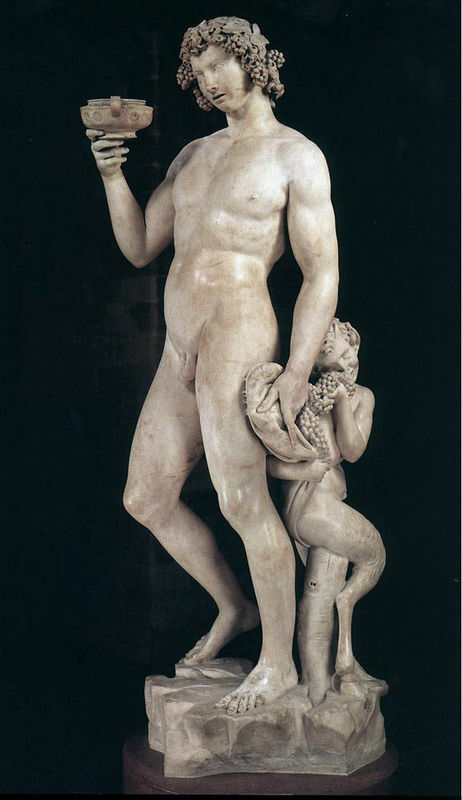 The sculpture of David reveals a relationship between Renaissance art and Greek mythology. 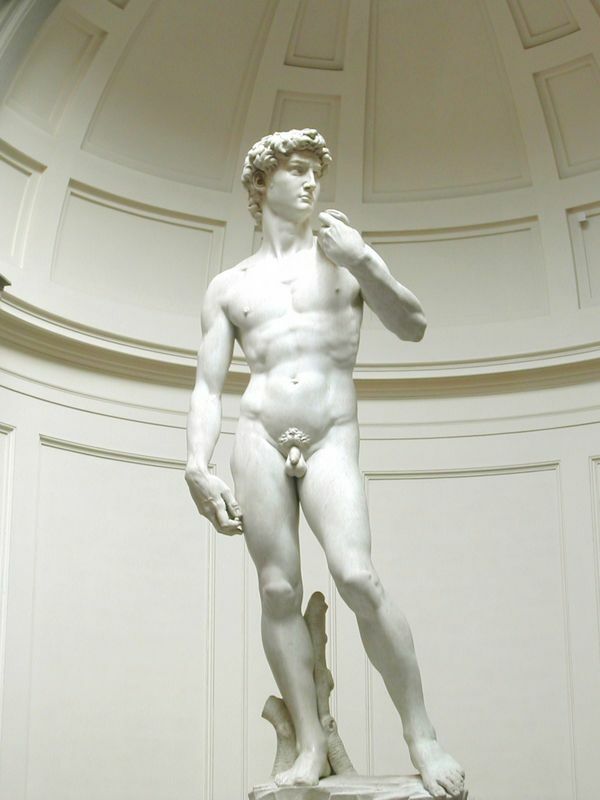 Michelangelo used his advanced knowledge of the human body to create his nudes. Furthermore Michelangelo was primarily interested in how concrete figures could be encompassed within an outside shell. He was liked religious themes and focused on the image of Christ in many of his drawings, frequently drawing the same images until the emotion in his pieces became intense. Michelangelo had a keen eye for light and shadow and grasped that they can represent volume and shape in both a sculpture and a painting. Thus he created many freestanding sculptures. Whereas Leonardo da Vinci painted his figures with straight axles and lines Michelangelo was more inclined to introduce curves and diagonals. Unlike da Vinci, Michelangelo produced figures that twisted around and complimented each other's forms. Michelangelo was fiercely protective of the sketches he produced in preparation for his works. He was intensely paranoid that others would try to plagiarize his work and thus kept a firm watch on where his sketches ended up, sending many of them home to his family. Today there are over 900 of Michelangelo's drawings still in existence and they reveal how he explored and developed how his final creations would look when they were finally finished.